The Obama administration on Thursday appealed two federal cases that found portions of the federal Defense of Marriage Act (DOMA) unconstitutional. U.S. District Judge Joseph Tauro ruled in July against the 1996 law that defines marriage as a heterosexual union for federal agencies and allows states to ignore the legal marriages of gay couples performed outside their borders. Tauro's decision only considers the law's definition of marriage, which prohibits married gay and lesbian couples from accessing federal benefits such as Social Security. He ruled the law violates the Fourteenth Amendment's equal protection guarantee. In its defense of the law, the administration called DOMA “rational” because states have yet to adopt uniform rules on gay marriage. Joe Solmonese, president of the Human Rights Campaign (HRC), the nation's largest gay rights advocate, disagreed with the filing. And Solmonese called on the president to support marriage equality for gay and lesbian couples. 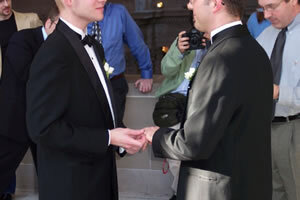 Obama supports recognizing gay couples with civil unions, but he recently said that he is “evolving” on marriage. Both challenges were filed in Massachusetts, the first U.S. state to legalize gay marriage. One was filed by Massachusetts Attorney General Martha Coakley and the other by several gay couples being represented by the Boston-based gay rights group Gay & Lesbian Advocates & Defenders (GLAD). “DOMA is an unjust and unconstitutional law that discriminates against Massachusetts married couples and their families,” Coakley said in a statement last year.